Resident Evil 4 arrives on iPhone in this watered-down yet still enjoyable adventure. For a while, we've had our eyes on Resident Evil 4. No, not the excellent GameCube and Wii versions; we beat those years ago. We mean the $6.99 iPhone edition. Capcom released it a couple of months ago to mixed reviews, and despite our love for the original, we had trouble making the purchase. Well, after spending several hours shooting monsters and collecting loot, we're happy to report that the iPhone RE4 is worth the cash. First, it's important to note that this pint-sized edition pales in comparison to its console big brother. Capcom nixed some of the scenes, eliminated most of the voice acting and shrunk the levels. In other words, don't expect to find the entire GameCube adventure on the phone. We'd like to assume you already knew that, but there are quite a few clueless gamers upset that the iPhone version comes up short. That said, there's a lot to like. Once again, players guide Leon Kennedy through a strange European village in search of the U.S. president's daughter. Along the way, they'll encounter infected townsfolk, a giant called El Gigante and the master behind the whole operation, Osmund Sadler. 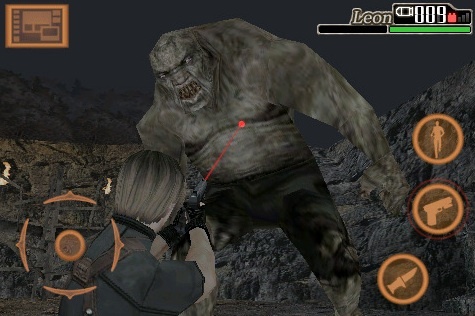 Although Capcom shortened all of the levels (some take less than 20 minutes to complete), the designers still managed to make the game feel like RE4. 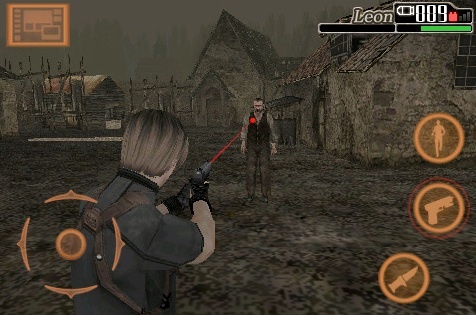 You explore the environments from a behind the back perspective, maneuvering Leon with a virtual thumb stick, located on the bottom left corner of the screen. To shoot and slash enemies, you'll need to press the gun and knife icons, respectively; to leave weapon mode, tap the walk icon. Overall, the game's enjoyable. We broke crates to score weapons and ammo, threw grenades and shook off monsters. Capcom even included signature RE4 moments, including the first run-in with the chainsaw wielding maniac, the heroic last stand in the abandoned house and missions where we had to protect the president's daughter, Ashley, from Sadler's minions; you direct her to stay put or follow Leon using an on screen prompt. Playing the game, however, requires a bit of patience. Rather than include a quick turn feature, the developers force players to manually turn Leon using that thumb stick. Unfortunately, he's a bit on the slow side. In addition, aiming takes some getting used to, as the reticule flies all over the place. Finally, enemies have a nasty habit of appearing from nowhere, so we suggest looking behind Leon every so often. On the positive side, none of those issues ruin the experience. It's a bit short (you can beat the game in a few hours), but for $7, Resident Evil 4 comes recommended, especially if you dig the original. Now all Capcom has to do is release additional chapters via download, and we'll be set. What's Hot: Impressive 3-D graphics, decent gunplay, the creepy merchant returns, includes key scenes from the smash hit original. What's Not: You cannot reload weapons from the item screen, there's no quick turn feature, Capcom removed some of the game's scenes and boss fights, only last a few hours.